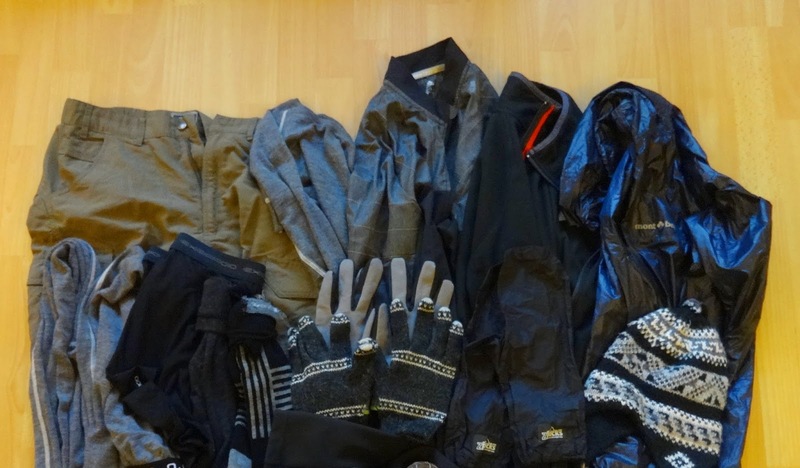 *Update 02/02/2015: I have since come back from my section hike with the gear described below. I will add some additional notes such to this post and give some additional thoughts below. In the past I have done several gear list breakdowns by season, and I have been itching to do another one for this winter's kit. However it has been a warmer winter than usual, plus I was forced to push back my January section hike to the end of the month, so I had not finalized my gear until recently. Early spring is often nearly or just as cold as winter here--especially further up north, where I will be continuing my E1 hike--so this set up should still get put to good use in spite of the warm start of the year. As usual, I will note that this gear list (as well as any other gear list of mine) is not static or set in stone. I always keep a keen eye on weather reports, which of course can have a big impact on what I may or may not take with me. This particular section hike the estimated low temperatures were supposed to be around -6 to -8 C (21 to 17 F), but this of course can change significantly (and did!). In the end the lows only got down to around -3C, most of the time temps hovered around 0C, and rather than one day of snow flurries and two days of sun there was steady snowfall nearly the entire trip. There was at least 50cm more snow by the time we left than when we started the trip. Please note that I have rounded to the nearest 5 grams to make math easier and have nice, round numbers--just a personal preference now after creating so many gear lists. First, here is all the base gear all packed up in my pack of choice, a Zpacks Arc Blast 52 with two hip belt pockets. *Note: The section of trail I am hiking has several trail shelters available for hikers to use, and I made good use of them on this trip. By my count there were at least 10 different trail shelters in the area we hiked in that we had reasonable access to on and slightly off trail. So my poncho/tarp was my "just in case" shelter, but I am quite confident that if I had to use it things would have been just fine. Food bag (red silnylon dry bag)--not counted in base weight, but if you are curious all my meals and snacks for this 3 day trip come to 1555g / 3.4lbs. Long handle spoon (Sea to Summit hardened aluminum) is included in the weight of my cook kit, but stored in my center pocket. Two pair of gloves in blueish Cuben stuff sack--one pair of alpaca liners and one pair of Zpacks waterproof breathable mitts--I keep in my black hip belt pocket, but count as clothing worn. If you've been following my blog and read my other clothing worn breakdowns, you might notice that not much has changed. Last winter I had a good system of clothing, so I only tweaked a few things. I will note that since taking this picture I changed my mind on which socks to bring, and replaced one pair for another. I also forgot to include a few articles of clothing simply because they were misplaced, sorry about that! 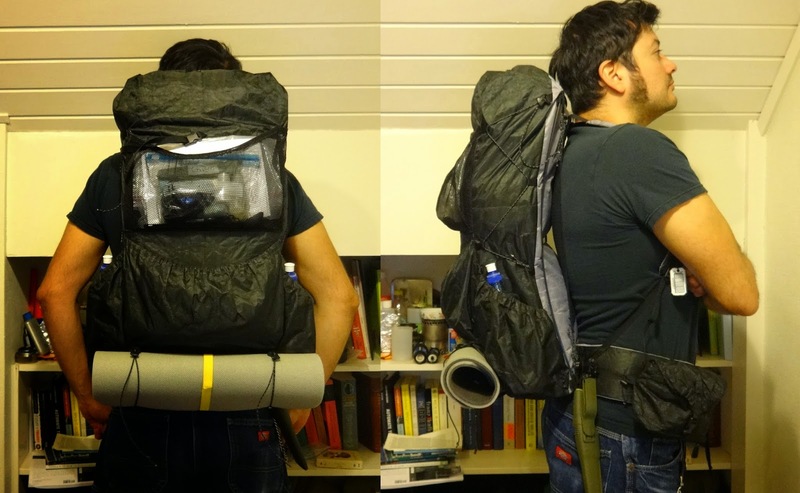 But this is most of what I will be wearing for most of the time while hiking--though of course a layer or two will get strapped on top of my pack as needed when I am too warm. If there is a cold sap, I can of course put on my camp/sleep clothing listed above. I doubt I will need to hike in my down jacket, but we'll see how the weather goes. Now some might think my layering is excessive for projected lows of -6 to -8 C (21 to 17 F), but I have experienced several pretty extreme cold saps here in Scandinavia. Then again, some of you that run on the cold side might think I'm crazy! Anyhow, after a few nights of it being much colder than expected--and note that I often have a thermometer with me--I learned my lesson and always take an extra layer or two. Having an extra top like a nice synth fleece laying next to you when you wake up from the cold in the middle of the night is really worth it. It helps a bit to dull the bitter curses directed at the meteorologists that claimed it would be -2 when in reality it was -9. Looking forward to my trip this weekend. I will try and shoot a "what's in my pack" video for this winter gear list if I have time, so keep your eyes peeled. Otherwise, I'll keep this one short, sweet, and to the point. Stay warm out there. The trip went well and there is little I would have done differently. The one thing that I wish I would have had was either snowshoes or cross-country skis, as we got a ton of snow. There where times we had to hike though big patches of trail with snow up to our knees, sometimes up to our hips in big snow drifts! In fairness to myself, I did keep a keen eye on the weather and there was little indication of so much snow. The snow conditions also presented some unique conditions that I will discuss further in my upcoming trip report. But amount of snow aside, the temperatures were also higher than expected, which caused the snow to be heavy/slushy/damp most of the time. Due to these conditions my feet by the end of the day were wet. They were not totally soaked, but fairly damp. However while hiking my feet were just fine--warm even, given my choice of socks. But when I stopped hiking my feet did get chilled, though nothing approaching frostbite territory. So the one thing I would have changed would have been my sock game, given the wet conditions. Though I didn't always have wet socks, of course. I slept with my hiking socks inside my sleeping bag (in my sleeping pants' pockets) to dry out, which works really well. So in the morning and for the first few hours of hiking my feet/socks were actually pretty dry considering the conditions, especially on parts of the hike where snow had been cleared or packed down. Then of course my sleep socks stayed quite dry in my pack, and felt great putting on before going to sleep. I could have also used these socks in case of an emergency, but as I said my feet while hiking were just fine. I would have switched out my synth socks for a pair of thin wool socks due to the stink alone. My synth socks really stunk by the end of the trip. I would have also added a pair of vapor barrier liners in the form of a few plastic bags for added warmth and comfort around camp. So the new set up would be: thin wool sock, plastic bag, thick wool sock, shoe, gaiter. A few plastic bags don't weigh much, so next time I am out I will take them as a "just in case" measure. Though last winter when I was out in colder temps and hiking through plenty of snow (including occasional waist high snow drifts), my feet were drier than on this trip--my socks only being slightly damp. I would only change my shoes if I knew it was going to be steady cold of lower than around -10C / 14F to some insulated winter boots that I recently bought. Other than my sock situation, I wouldn't have changed anything else on the trip. Everything else worked out from good to great. I got a lot of good use out of my rain gear to keep all the snow off me (hiking pants stayed pretty dry in spite of all the snow), and my gaiters helped keep snow out of my shoes and give a slight warmth bump. Cooking with Esbit in winter is so much easier than alcohol, so my stove and meals worked out great. I continue to love my Zpacks Arc Blast, including the hip belt pockets and custom center pockets. Also got to wear my new-ish Zpacks rain mitts for extended periods of time (the majority of the trip really) and they worked excellently. They are warmer you might expect for such thin/light mitts, and fit my other gloves quite well inside them--thought I mostly wore just my glove liners and the mitts. Hands stayed remarkably dry, even when in contact with quite a bit of snow. I even made snowballs just for fun and also to test out the mitts. I'm very impressed with these mitts. Just a few things off the top of my head. As I said before, I'd like to do a video expanding on all this when I have the time--maybe a gear list and post-hike video in one? We'll see. Until then, take care and hope all this was helpful.